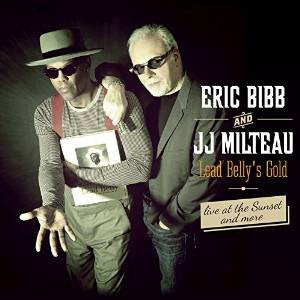 I just received the newest release, Lead Belly's Gold, from Eric Bibb & JJ Milteau and it's pure gold! This release, composed mostly of traditional and Lead Belly originals is spiced with a few originals by Bibb and Milteau. Opening with Grey Goose, Bibb handles vocals with only basic percussion by Larry Crockett, his own guitar accompaniment and Milteau on harp. With a light hearted approach the song seems to float. A medley of When That Train Comes Along/ Swing Low Sweet Chariot features some of the best vocal work that I have heard from Bibb. Soft, heartfelt and sensuous, backed by expressive harp work from Milteau. Very nice. On A Monday has a really nice gait. With it's playful nature, Michael Robinson.s backing vocals and Cajun flare it almost seems a celebration of a prison song. The House Of The Rising Sun has an eerie serenity that I have never heard from this track. Bibb's rich vocals and Milteau's melodic harp work seem the perfect match for this beautiful track. Back in a Cajun feel, Midnight Special retains much of the rock beat that it has come to be associated with but keeps a fresh sound. Bring A Little Water, Sylvie has a light Piedmont feel with Bibb's vocals and Milteau's harp just riding lightly on the melody like a cloud. Addition of bass by Gilles Michael and drums by Crockett on Where Did You Sleep Last Night gives it a very clean aesthetic with only Bibb on vocal and Milteau on harp. Very nice. Pick A Bale of Cotton falls very close to the original Lead Belly arrangement with solid vocal and guitar enhanced by harp and drums. Maintaining much of the waltz feel of Goodnight, Irene, Bibb adds a soulful vocal and Milteau nicely compliments his vocals on harp with nicely accented snare work by Crockett. Rock Island Line is a blues rocker with a train feel. Given that little bit of extra spice, this track delivers. Bourgeois Blues is another of my favorite tracks on the release with it's low slung delivery and pure blues feel. Milteau lays in a really sweet harp solo over Bibb's guitar cords. Delivering this hard track with light, effortless confidence has a cool result. Very nice! Bibb original, Chauffeur Blues is written from the perspective of Bibb as Led Belly speaking to former boss John Lomax. Pointed and crisp. Stewball is a clever little story about a race horse and with it's uptempo rock style adds a different dimension. Titanic, with it's distinctive picking features Bibb on vocal and banjo with Milteau on harp. Maintaining it's early blues styling but with Bibb's warm vocal, this track is smooth. Wrapping the release is Bibb original, Swimming In A River Of Songs. A happy go lucky track, this concludes possibly my favorite Bibb release with a bopping beat. Very nice!